Coaxial cable – was used on networks in the olden days, however today’s networks moved on to faster and tougher cables. This is not to say that coaxial cables will no longer be encountered as some networks that used this type of cable might still do so because their environment is still the same and so they feel that there’s no need to upgrade. 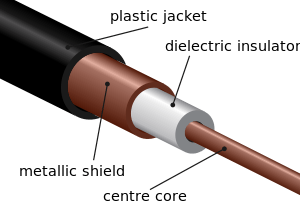 The above figure shows an example of a coaxial cable, which looks similar to the cables used for TVs. There are two types of this cable Thick and Thin coaxial, although the two are no longer popular; out of the two thin coaxial is more popular. It’s about 0.25 inches in diameter and has a max length of about 185 meters and they use the BNC connector. RG 59 /U used for low power video connection. RG 6 usually used for cable TV and cable modems. Fiber-optic Cables – unlike the other cables, which uses electrical signals; fiber-optic uses light and thus doesn’t suffer from cross talk or EMI. It’s made either from glass or plastic and supports greater distances and speeds, we’re talking about kilometres not meters like traditional cables. This type of cable offers to modes of transmission single mode fiber (SMF) and multimode fiber (MMF). In Multimode fiber hundreds of light rays bounce in an angle until it reaches its destination, while in a single mode fiber there’s only a single beam that travels in a straight line. Because of the bouncing of the rays in a MMF, the light weakens and slows down until it drops, which is why SMF supports greater distances and speed than MMF. Media connectors help connect the cables to the devices and so it acts like an interface between the two. The most common connector used for computer networks is the RJ-45 connector, which looks very similar to the telephone connector (RJ-11). The RJ-45 connector supports 8 wires while the RJ-11 supports 6 wires. These connectors are used to connect coaxial cables (including RG 59/U and RG 6) into the device, they’ve a bolt which screws into the device to hold it securely inplace. This type of connector is the connector used for serial transmission recommended by TIA/EIA standards. Today we have a third revision of this standard called RS-232C and used to connect peripherals such as scanners, printers, modems etc. Although USB is most popular today, RS-232 is still around, however. There are two types of these connectors, a DB-25 with 25 pins and DB-9 with 9 pins and they come in male and female connections. Because there are several connectors to use for fiber, the type is dictated by the implementation used. The IEEE 1394 Fire wire although used to connect peripherals, it can also be used to create a small network. The USB however is mentioned because many vendors make wireless adapters that plug into a USB connector, there two types of USB connectors a Type A and a Type B USB connector. The type A is the most popular even though Type B can be found in some devices.